DES PLAINES, IL — Achieving high follow-up rates for a difficult-to-track violently injured emergency department population is feasible. That is the finding of a study to be published in the November 2018 issue of Academic Emergency Medicine (AEM), a journal of the Society for Academic Emergency Medicine (SAEM). The Flint Youth Injury (FYI) Study, a prospective study, demonstrated that tracking hard to reach, assault-injured, drug-using youth populations is possible through the use of established contact strategies and a variety of interview locations. The lead author of the study is Jessica Roche, MPH, a research specialist at the University of Michigan Injury Center. 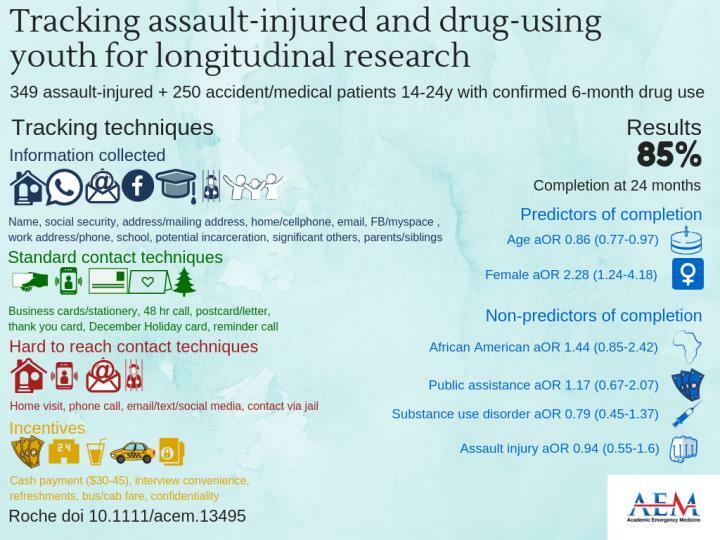 The findings of the study are discussed in a recent AEM podcast, Tracking Assault-Injured, Drug-Using Youth in Longitudinal Research. Roche, et al., suggest that future studies focusing on hard-to-reach populations should factor in the time needed to achieve successful follow-up retention and the number and types of contacts needed to ensure the continued involvement of as many participants as possible. The authors further suggest that newer developing methods of contacting participants through advancements in technology be explored, suggesting that using these methods to reduce attrition may improve the quality of hospital- and ED-based violence prevention programs and help promote evidence-based best practices. "This important paper dashes the myth that long-term follow-up in a trauma patient population is unachievable. Not only does it set the benchmark for what can be achieved in terms of follow-up in this difficult patient population, it, more importantly, outlines the methods and resources that we all must be willing to employ as we seek to honestly evaluate the long-term impact of our own violence prevention efforts."